BeerViking: Drink London at London Drinker! While it's often London's new keg and bottled beer breweries that get the limelight, cask ale microbreweries are on the up as well. So where just a few years ago you'd have been hard pressed to have a real ale festival with more than a dozen interesting London-brewed beers, this year's London Drinker Beer Festival claims that around 50% of its ales are from London. Indeed, for the second year in a row the festival – which finishes today, so you still have time to get to it if I can get this online quickly – has a whole bar devoted to local beers, or LocAle, as CAMRA calls it. LDBF is 30 years old this year, and proudly bills itself as "the longest running beer festival in London in the same venue" – that's the old Camden Town Hall (now the Camden Centre) on Bidborough Street, opposite St Pancras station. It's a few years since I spent time there – it usually coincides with a big trade show in Germany where I had a regular work gig, so I've often been out of the country. 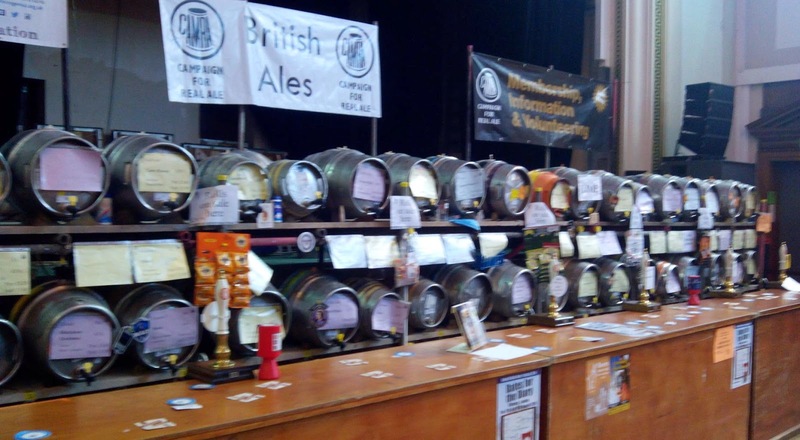 It's a great festival for trying a wide variety of cask beer. This year had plenty of volunteer staff so I never had to wait very long, and while there were a couple of beers that I didn't like, all those I tried were in good condition or better. I know some people dislike how crowded LDBF can feel by early evening, but I recall from past years that if you take advantage of the seating in the balcony not only do you get elbow room and a place to sit, but you can also see that the crowds are actually a bit illusory. Sure, there's lots of people standing around, but somehow the shape of the big square main hall makes it look worse at floor level than it is, whereas from above you can see the free space as well.